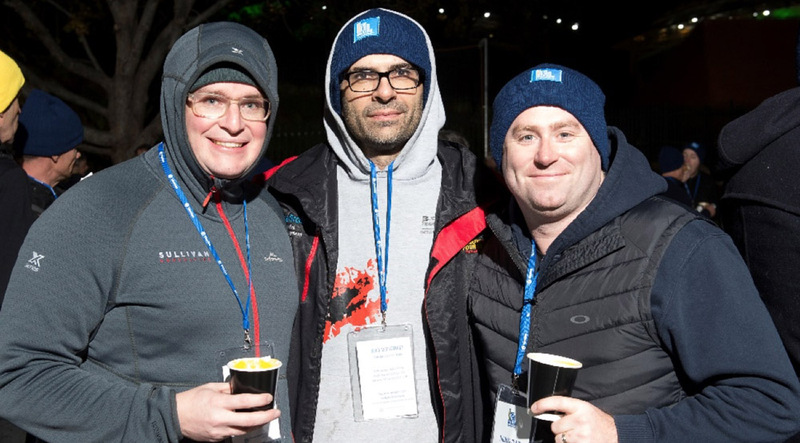 On Thursday 21st June, with the evening weather forecasted to drop to just 7°C, I participated in the 2018 Vinnies CEO Sleepout at Adelaide Oval, raising valued funds for the St Vincent de Paul Society. 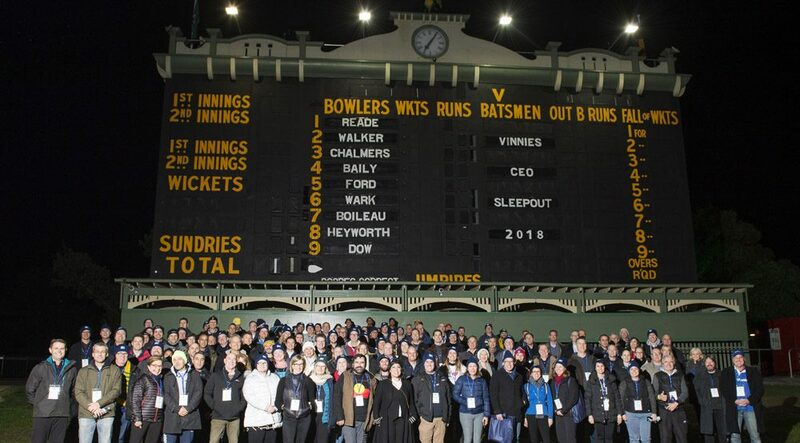 The night began with steaming tea and coffee to warm up, followed by a group photo under the iconic scoreboard with all 120 Sleepout participants. There was a mix of people who had participated in previous years and some new faces, unsure of just how challenging the night ahead would be, both emotionally and physically. We were treated to a traditional smoking ceremony followed by an informative speech from David Wark (Vinnies’ SA CEO). He discussed the opening of Vinnies’ new Women’s Shelter in Adelaide which houses 20 women and children each night and complements the existing Men’s Shelter that houses 47 men each night. 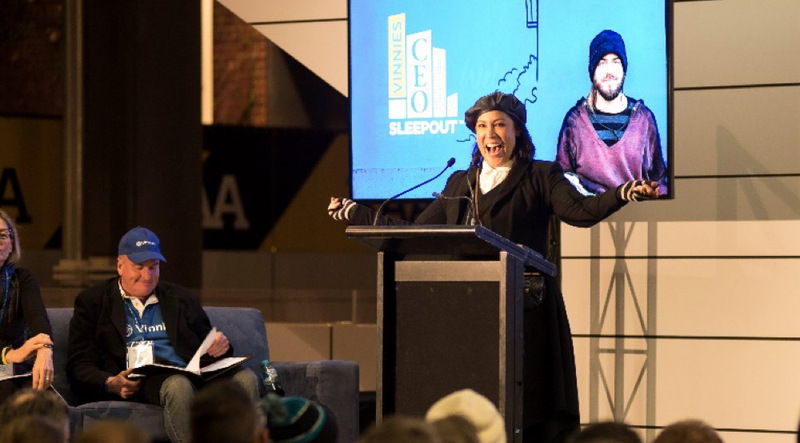 Our MC Kate Ceberano was entertaining as always, ensuring the mood was light in preparation for the long night ahead of us. We were also involved in an auction run by Adelaide’s leading female auctioneer, Sharon Gray. The auction provided us with an additional opportunity to raise funds for Vinnies, with prizes including concert tickets, holiday packages and an Adelaide Oval RoofClimb experience. Dinner was provided by the team at Fred’s Van and featured a sausage sizzle, paired with a selection of minestrone or pumpkin soup. Standing in the queue for dinner, I was struck by the realization that although this was a novelty for us, it is a reality facing 116,000 Australians each night. Imagine queuing up for dinner in the hope that it will still be available once you’ve reached the front of the line, followed by the uncertainty of finding a safe, warm place to sleep. More concerning is that 13% of South Australia’s homeless population is under the age of 12. As a parent, I couldn’t imagine how challenging it would be to face the reality of homelessness with a child or children in tow! As I attempted to sleep in the cold, uncomfortable conditions, it was humbling to know that my total fundraising amount of $6880 could be used to provide 1000 warm and nutritious meals through Fred’s van or provide a month of safe accommodation for a woman and her 2 children who had potentially escaped domestic violence. Leaving Adelaide Oval at 5:30am to head home to my family, creature comforts and work, I was comforted by the knowledge that, together with everyone who generously donated to my campaign, I had done my best to make a difference in someone else’s life. With all Sleepout events now complete, Vinnies have exceeded their 2018 fundraising target of $6,420,000 by reaching a total of $6,846,993 and donations are open until 31st August 2018 so this number could still grow! I’d sincerely like to thank everyone who donated to my CEO Sleepout campaign, together we truly have made a significant difference. I’m already looking forward to participating in this event again next year!